BOOKBAG BUNNY on SALE Today ONLY 50% OFF! Bookbag Bunny from Cute Crochet Shop is 50% TODAY ONLY, just in time to crochet for Spring! Click HERE to purchase this pattern for $1.99. The pattern will return to original price tomorrow! Our adorable Bunny will steal any little girl’s heart, but is also perfect for the young-at-heart! She is ready for your Spring decor or to delight a little girl! Bookbag Bunny measures almost 15″ tall and is made completely with worsted weight yarn. 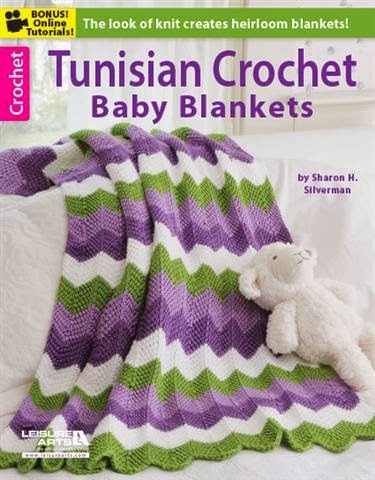 I was recently asked to take a look at the new Tunisian Crochet Baby Book by Sharon H. Silverman. The book is published by Leisure Arts. The book contains 8 pretty designs that highlight several different tunisian crochet stitches including cables, ripples, stripes, bobbles, and basket weave. Each design is separated from Easy to Intermediate. “If you are new to Tunisian crochet, or need a refresher on the basics, the Tunisian Crochet Skills section will help you get started. Free online technique videos are also available”. Sharon was interviewed by Cute Crochet Chat below. Some of our favorite designs from the book are highlighted during the interview. 1 How did you learn to crochet and how old were you when you learned? All sorts of crafts appealed to me when I was little. I made “horse rein” on what some people call a Knitting Nancy, did mosaics, made potholders, and so on. My mother taught me to crochet when I was 6 or 7 years old. She also taught me to knit, but I never felt as comfortable with that. Crocheting was always fun. I used some published patterns but also made up my own designs. I vividly remember using a K hook with two colors of blue yarn held together to make a shoulder bag.
. How long have you been a freelance crochet designer? I have been a freelance writer since 1988, and I switched from travel writing to crochet design in 2005. 3 Are you a part time or full time crochet designer? Crochet design makes up the bulk of my current work. I also write a quarterly column, “Shop!” for The Hunt magazine (a Brandywine Valley lifestyle magazine), do public relations writing for several local museums and cultural sites, and pick up other writing assignments occasionally. How did you learn Tunisian Crochet? I discovered Tunisian crochet in a stitch dictionary while I was designing projects for my first crochet title, Basic Crocheting: All the Skills and Tools You Need to Get Started. I learned the basics from that book, then sought out other sources to extend my knowledge of the technique. It was really exciting to see the fabric that Tunisian crochet creates. I never liked projects with rivers of double crochet stitches—too loopy!—and Tunisian had a totally different look. 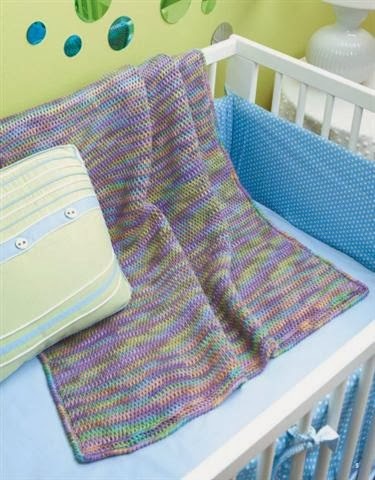 5 Where did you get your inspirations for the afghans in this Tunisian Crochet Baby Blankets book? Tunisian crochet lends itself to interesting textures and colorwork. I was inspired by those possibilities, and by my interest in bringing a contemporary color palette to today’s nurseries. I also wanted to present projects at various levels of difficulty; people who were newer to Tunisian crochet would successfully make beautiful projects that would build their confidence, and more advanced crocheters could try something challenging and add to their skill set. 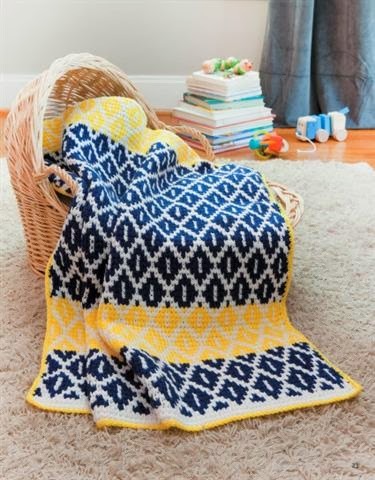 The most complicated project in the book is “Bright Strands,” which uses stranded colorwork in vivid yellow, navy, and white. It’s rewarding to teach this technique through my pattern. 6 What are your favorite kind of crochet projects to make and/or design? If I’m making something for myself, I like fitted garments as opposed to boxy ones. Crochet lace makes wonderful accessories like scarves and shawls. For design, it’s exciting to be inspired by the colors and patterns in nature and to translate that into a pattern that other crocheters can use. Blankets and accessories are the easiest from a practical pattern-writing standpoint, since each project needs instructions in only one size. 7 \ Do you have a favorite weight or brand of yarn that you like best? Depends on the project. There are many excellent yarn companies, large and small, out there today. The products are such high quality, with a limitless selection of materials and colors. I love Egyptian mercerized cotton in lace weight for shawls and lightweight wraps, but I like DK and worsted weight yarn as well. I don’t gravitate toward bulky yarns as much, but I’ll try anything as long as it does not split or shed. Can’t stand fibers flying into my eyes and nose! 8 Are you working on anything new at the moment? I just finished a book for Stackpole Books, Tunisian Crochet for Baby, which is scheduled for publication in September 2014. Thank you, Sharon, for such an interesting interview! Sharon’s book can be purchased at the Leisure Arts website or on Amazon. As always, our readers have a chance to win a copy of this book. For a chance to win, please leave an email address (or some other way of contacting you!) in the COMMENTS. We will pick a random winner on 2/18/14. Without an email address, I cannot contact you in case you are the winner! The review and giveaway copies of this book have been provided by Leisure Arts.